For other uses, see Versace (disambiguation). Gianni Versace S.r.l. (Italian pronunciation: [ˈdʒanni verˈsaːtʃe])[a] usually referred to simply as Versace, is an Italian luxury fashion company and trade name founded by Gianni Versace in 1978. The main collection of the brand is Versace, which produces upmarket Italian-made ready-to-wear and leather accessories, while other diffusion lines are Versace Collection (mainly in the US), Versus Versace and Versace Jeans. The Versace logo is the head of Medusa, a Greek mythological figure. The logo came from the floor of ruins in the area of Reggio Calabria that the Versace siblings played in as children. Gianni Versace chose Medusa as the logo because she made people fall in love with her and they had no way back. He hoped his company would have the same effect on people. The Versace brand is known for its innovative designs having symbolic flashy prints and bright colors. The company announced in 2018 that it would stop using fur in its collections. On 25 September 2018, Michael Kors announced their intention to acquire all outstanding shares in Gianni Versace S.r.l. for $2.12 billion (USD); the acquisition was completed on December 31, 2018. In 1972, Gianni Versace designed his first collections for Callaghan, Genny, and Complice. In 1978, the company launched under the name "Gianni Versace Donna." 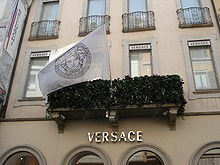 The first Versace boutique was opened in Milan's Via della Spiga in 1978. Versace was one of the few independent designers who was in control of everything about the brand, from designing to retailing. In 1982, the company expanded into the accessory, jewelry, home furnishing, and china industries. In 1993, Donatella Versace created the "Young Versace" line as well as "Versus." In 1994, the brand gained widespread international coverage due to the black Versace dress of Elizabeth Hurley, referred to at the time as "that dress". 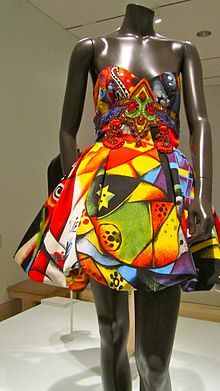 Versace was often described as the "Rock n' Roll designer" because they designed for many famous clients, including Elton John and Michael Jackson. Versace designed the stage costumes and album cover costumes for Elton John in 1992. Versace has also designed clothing for the Princess of Wales and Princess Caroline of Monaco. The Versace company is known for using the same models in their ads as they do on the runway. After the murder of Gianni Versace in 1997, his sister Donatella Versace, formerly vice-president, took over as creative director and his older brother Santo Versace became CEO. Donatella's daughter Allegra Versace was left a 50 percent stake in the company, which she assumed control of on her eighteenth birthday. In 2000, the "green Versace dress" worn by Jennifer Lopez at the 42nd Annual Grammy Awards gained a lot of media attention, being voted as the "fifth most iconic dress of all time" in 2008, with Hurley's 1994 dress being voted first in a Daily Telegraph poll. As of 2016[update], more than 1500 boutiques operate worldwide; the first boutique outside of Italy was opened in Glasgow, Scotland in 1991. In October 2018, Versace announced to showcase the brand’s first ever Pre-Fall season show in New York on 2 December. The show is scheduled on Gianni Versace’s birth date. In January 2019, Gianni Versace S.r.l. joined Capri Holdings Limited, forming a new global fashion luxury group together with Michael Kors and Jimmy Choo. In 2006, Gianni Versace S.r.l. entered into a partnership with Automobile Lamborghini S.r.l. to produce the Lamborghini Murciélago LP640 VERSACE. The car had a Versace white satin interior with the Versace logo embroidered into the seats. The car was available in black and white. There were only ten units produced. The car was sold with a complementary luggage set, luxury driving shoes, and driving gloves. The Versace company teamed up with AgustaWestland in 2008 to create the AgustaWestland AW109 Grand Versace VIP luxury helicopter. The helicopter includes Versace leather interior and a design on the outside. In 2011, Versace and H&M released a new line of clothing that would be sold in H&M stores. The store sold both men's and women's clothing and home items such as pillows and blankets. In 2015, Versace collaborated with dancer Lil Buck to release a line of sneakers. In 2018, Ronnie Fieg and Donatella Versace debuted their Kith x Versace collection, which featured a modified medusa logo with "KITH" written over its eyes. Versace Men's Fall 2019 collection featured several items with the logo of Ford Motor Company. According to the fashion house, the two companies joined forces to channel "the excitement of buying your first car. Excitement and aspiration of owning something as an extension of one’s personality, something very connected to the idea of being a man." Versace partnered with the Mind Group firm in China in 2015. The two companies designed luxury residence towers called the "Versace Residencies." The goal of the creators were to combine Versace's luxury home elements with elements of traditional Chinese culture. This same year, Versace partnered with the ABIL Group in India to develop another residential project. These luxury homes are located in South Mumbai. In 2015, Donatella Versace was featured in Riccardo Tisci's Givenchy campaign. Soheil Abedian, of the Sunland Group, approached Versace in 1997 and successfully proposed a luxury hotel built upon the Versace brand; the first Palazzo Versace opened on Australia's Gold Coast on 15 September 2000. The hotel was sold to a Chinese consortium in December 2012. The second Palazzo, the Palazzo Versace Dubai, was completed in December 2015 and is located on the foreshore of Dubai Creek. A third Palazzo is under construction. The Palazzo Versace Macau was announced in 2013 and will be built in partnership with Macau's largest casino operator SJM Holdings. The Palazzo Versace hotels are the first fashion-branded hotels in the world and place an emphasis on beauty and luxury. ^ According to a January 2018 Vogue interview with Donatella Versace, Versace is correctly pronounced /vərˈsɑːtʃeɪ/ vər-SAH-chay in English as opposed to the popular pronunciation of /vərˈsɑːtʃi/ vər-SAH-chee. ^ a b "Bloomberg". Retrieved 20 March 2015. ^ a b Mesco, Manuela (25 April 2016). "Gianni Versace profit rose 17% in 2015, lifted by soaring sales". Il Corriere della Sera. Retrieved 25 May 2017. ^ "You've probably been pronouncing 'Versace' wrong, according to Donatella". Harper's BAZAAR. 2 February 2018. Retrieved 2 March 2018. ^ a b Davis, Daniel (2011). Versace. New York, NY: Infobase Learning. p. 29. ISBN 9781604139808. ^ a b White, Belinda (3 October 2012). "Not 'That dress' again? Lady Gaga wears Liz Hurley's Versace safety pin gown". The Daily Telegraph. Retrieved 14 August 2014. ^ Sun, Carol (Autumn 2001). "Transformation Parlor". Art Journal. 60: 42–47. ^ "Versace and Furla join designer labels ditching fur," Reuters, 15 March 2018. ^ "Michael Kors Holdings Limited to Be Renamed Capri Holdings Limited". investors.michaelkors.com. Retrieved 26 September 2018. ^ a b "Brand History". Versace. Retrieved 27 April 2018. ^ Matthew (28 January 2011). "History of Versace". Fashion in Time. Retrieved 14 August 2014. ^ "Gianni Versace profile". Victoria and Albert Museum. 12 January 2003. Retrieved 14 August 2014. ^ a b "Versace". Made-In-Italy.com. Retrieved 26 March 2016. ^ Gundle, Stephen (2008). Glamour: a history. Oxford University Press. ISBN 978-0-19-921098-5. Retrieved 1 May 2011. ^ a b Khan, Urmee (9 October 2008). "Liz Hurley 'safety pin' dress voted the greatest dress". The Daily Telegraph. Retrieved 14 August 2014. ^ "1997: Versace murdered on his doorstep". BBC News. 15 July 1997. Retrieved 14 August 2014. ^ a b Horyn, Cathy (15 June 2004). "A New Half-Owner for Versace, and She's Almost 18". New York Times. Retrieved 14 August 2014. ^ "Versace niece's $700m birthday gift". Sydney Morning Herald. 2 July 2004. Retrieved 14 August 2014. ^ "Allegra Inherits Versace's Fortune". WENN. Contactmusic.com. 30 June 2004. Retrieved 15 August 2014. ^ Freeman, Hadley (4 October 2004). "Versace struggles to regain its touch". The Guardian. Retrieved 14 August 2014. ^ a b Valerie (18 December 2003). "Fabio Massimo Cacciatori quits Versace CEO". DesignTAXI.com. Retrieved 14 August 2014. ^ "Versace Names Di Risio as Ceo and Strengthens Board". Women's Wear Daily. HighBeam Research. 27 August 2004. Archived from the original on 21 September 2014. Retrieved 14 August 2014. ^ Meichtry, Stacy (6 June 2009). "Versace CEO Di Risio Resigns". Wall Street Journal. Retrieved 14 August 2014. ^ Meichtry, Stacy (22 May 2009). "Bucked by Designer, Versace CEO Eyes Exit". Wall Street Journal. Retrieved 14 August 2014. 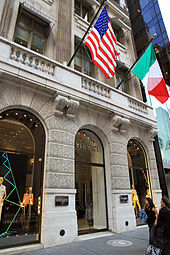 ^ "Company Profile | Versace US". Versace. Retrieved 14 March 2019. ^ Binnie, Isla (27 February 2014). "Fashion house Versace sells stake to Blackstone to fund growth". Reuters. Retrieved 14 August 2014. ^ Binnie, Isla (27 February 2014). "Versace Sells Minority Stake to Blackstone". Retrieved 27 February 2014. ^ Mesco, Manuela (27 February 2014). "Versace Sells Minority Stake to Blackstone". Wall Street Journal. Retrieved 14 August 2014. ^ Henderson, Damien (14 February 2005). "Glasgow's Versace loss may suit capital". Herald Scotland. Retrieved 14 August 2014. ^ Dalton, Matthew; Kapner, Suzanne (24 September 2018). "Michael Kors Woos Versace in Push for Foothold in High Fashion". Wall Street Journal. ISSN 0099-9660. Retrieved 25 September 2018. ^ "Michael Kors shares sink amid Versace rumors". New York Post. 25 September 2018. Retrieved 25 September 2018. ^ "Versace Company Profile | UK Online Store". Versace. Retrieved 14 March 2019. ^ "Versace To Host First Pre-Fall Show In New York". Retrieved 14 October 2018. ^ Smeyers, Mark (30 September 2006). "Murciélago LP640 Versace". Lambo Cars. Retrieved 4 April 2016. ^ "11 Incredibly Expensive Choppers". BabaMail. Retrieved 4 April 2016. ^ Gumuchian, Marie-Louise (20 March 2008). "Buckle up to Travel in Versace-Style Chopper". Reuter's. Retrieved 4 April 2016. ^ Wischhover, Cheryl (20 October 2011). "Here It Is: Versace for H&M, The Complete Collection". Fashionista. Retrieved 4 April 2016. ^ Carlos, Marjon (30 October 2015). "Versace and Lil Buck's Sneaker Collaboration Takes Flight Today". Vogue. Retrieved 4 April 2016. ^ "KITH DEBUTED UPCOMING VERSACE COLLABORATION AT ITS 'KITH PARK' RUNWAY SHOW". Fashionista. Retrieved 13 January 2019. ^ "Versace Men's Fall 2019". WWD. Retrieved 13 January 2019. ^ Martens, Cynthia (11 March 2015). "Versace to Partner With China's Mind Group". WWD. Retrieved 4 April 2016. ^ "ABIL Group partners with luxury brand Versace". Bricking News. 29 October 2015. Retrieved 4 April 2016. ^ Conlon, Scarlett (15 June 2015). "Donatella on Her Givenchy Campaign". Vogue. Retrieved 4 April 2016. ^ "Glitz abounds in Gold Coast tribute to Versace". The New Zealand Herald. 27 May 2000. Retrieved 14 August 2014. ^ Templeman, Tiana (15 September 2000). "The Rise and Fall... and Rise... of Palazzo Versace". Let's Travel Magazine. Retrieved 14 August 2014. ^ Calligeros, Marissa (29 February 2012). "Gold Coast's Palazzo Versace sold to Chinese for $68.5 million". Brisbane Times. Retrieved 14 August 2014. ^ Skene, Kathleen (29 April 2014). "Palazzo Versace GM Russell Durnell leaves five-star hotel's top job". Gold Coast Bulletin. Retrieved 14 August 2014. ^ Fahy, Michael (10 September 2015). "Palazzo Versace hotel in Dubai to open in December". The National. Retrieved 30 March 2016. ^ Bergin, Olivia (20 August 2013). "Palazzo Versace to open in Macau". The Daily Telegraph. Retrieved 15 August 2014. ^ "Versace teams up with SJM to outfit Macau hotel". China Economic Review. SinoMedia Holdings. 21 August 2013. Retrieved 21 August 2013. ^ O'Keeffe, Kate (21 August 2013). "Palazzo Versace Hotel Slated for Macau". Wall Street Journal. Retrieved 15 August 2014. ^ "History". Palazzo Versace. Retrieved 30 March 2016.